HeyPlantMan! Exotic Tropical Plants from St. Pete FL: Tiger Grass, Papaya, Passion Fruit, oh my ! Tiger Grass, Papaya, Passion Fruit, oh my ! Greetings everyone and hope you all are looking forward to a relaxing Memorial Day Weekend coming up. This Saturday and next, are the last 2 days of the downtown St. Pete Saturday Morning Market's regular season and we expect the crowds to come out to visit their favorite vendors, and get stocked up for the summer. Summer Market season begins June 7th, in Williams Park, and although smaller in size, there still will be great produce, foods, arts and crafts and plants. This past weekend, we had a great time down in Punta Gorda, for the Hibiscus Festival, with record crowds and a nice breeze to keep us cooled off. 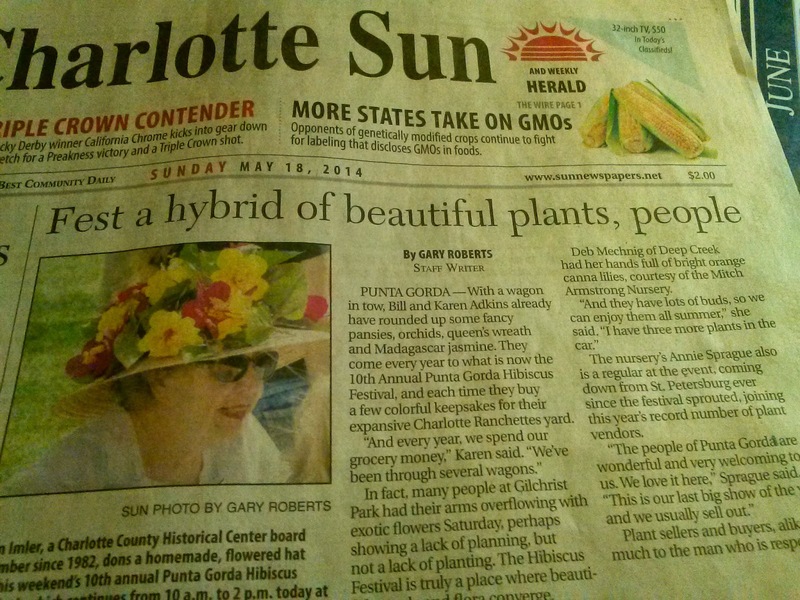 We even made the local Sunday edition paper ! The reporter did a great job of writing about the event, with some great pictures. The local women there love to dress up for the festival, as you can see here. 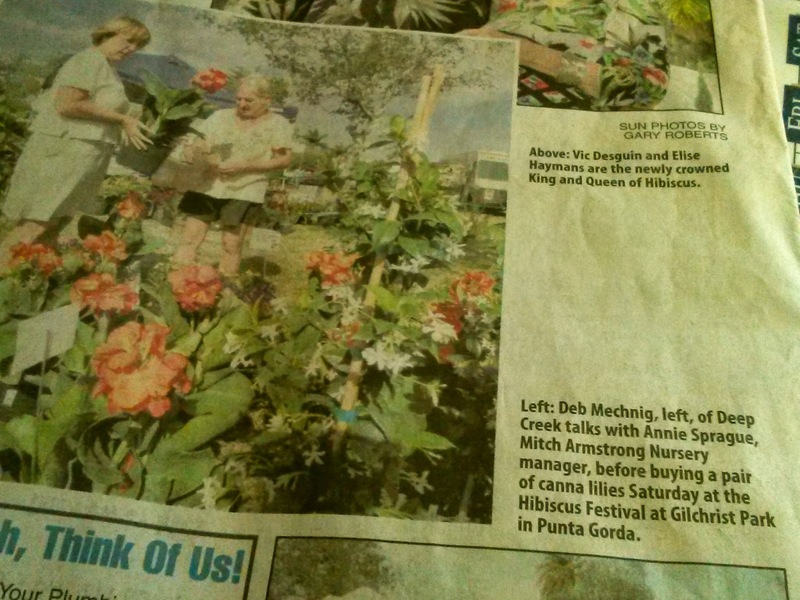 The nursery got a great plug with quotes from us and large pic of me selling some of our gorgeous Orange Canna Lilys. 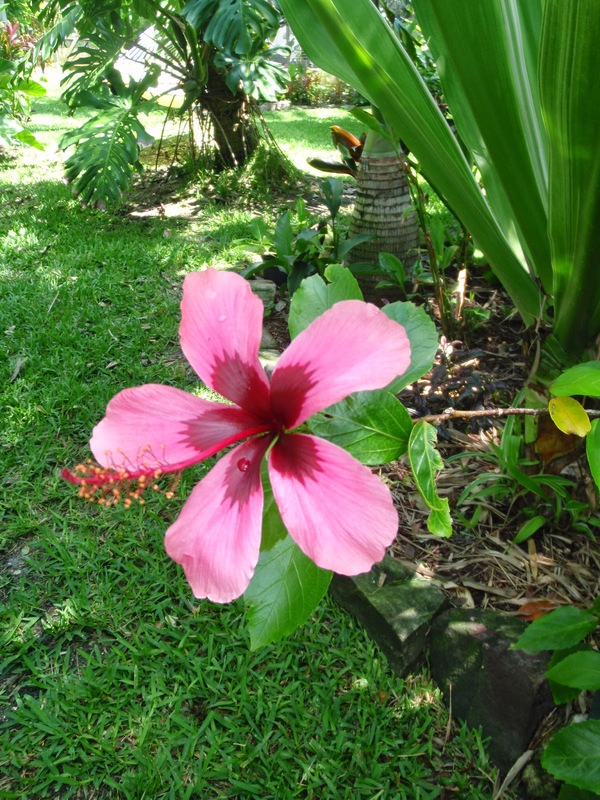 Of course, we had Hibiscus plants galore which customers quickly picked up. We brought 9 of the our 7 gallon, standard Hibiscus, Miss "Fiji Queen" with her beautiful variegated bloom, and they were sold out within a couple hours of the show starting. Great news, we have More ! You just have to come to market and you can see why they are so popular. This week at Market, we have a couple of standouts, that we know customers are going to enjoy. The first is "Tiger Grass" - This uncommonly found perennial grass is very popular for it's quick growth and gorgeous plumes. A non-invasive clumper, it resembles bamboo, and can grow 10-12 ft. high. From Thailand, the natives there use the plumes as brooms and the foliage can be used to wrap food ! We have them in 3 gallon containers and if you are looking for a striking grass as a sole specimen, or if you need to "hide" or fill in a blank area, this plant is made for you. 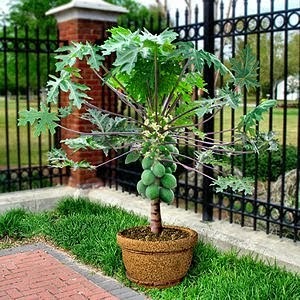 On the Edible side, we are back in stock with the popular "TR Hoovey" Dwarf Papaya tree. Popular since it only grows about 6-7 ft tall, and self-pollinating (you only need one), and produces tasty fruit quickly. Great for in-ground or in pots, it's a fast producer for papaya lovers. We still have in stock our Passion Fruit Vines, both the purple and the yellow. These vines are producing fruit already and ready to find homes where they can climb. People ask "what does it taste like?" often and the best answer we can give you is, it taste just like Sweet Tarts (the candy)...sweet with a hint of tang. People most often use it in juicing and it's a great addition to the blender when mixed with banana, pineapple, apples and oranges. EZ to grow and fast producing, with great health qualities. Looking for some great color for your summer gardens? You can't beat the striking colorful blooms of Canna lily, Lavender Plectranthus, Gallardia and Hibiscus which we will have at market. 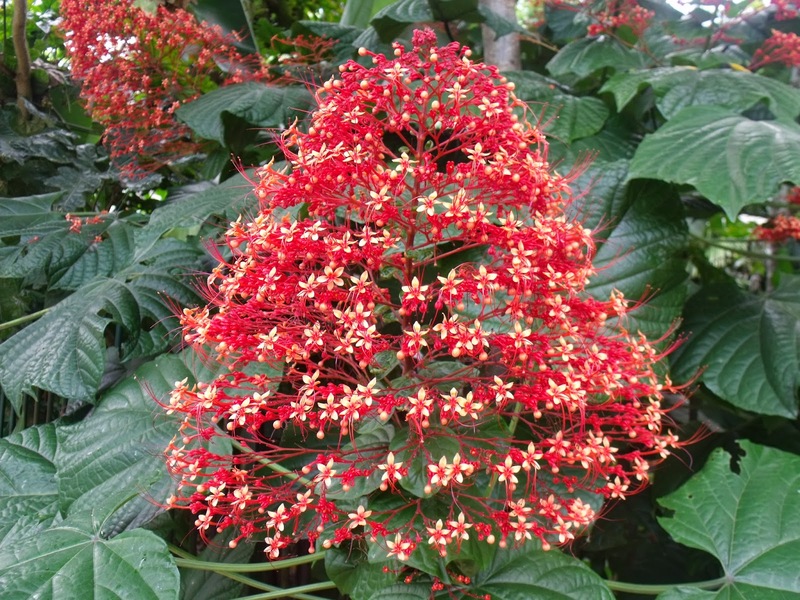 Also this week, we have Clerodendron Pagoda, which is one of Mitch's favorite plants. The bloom if very different and lasts a long time and it makes a great background plant. Also flowering right now, we have Yellow Plumeria, which is a super draught tolerant specimen. Looking for something different? We have Butterfly wing (Christia obcordata) and Giant White Milkweed (Hairy Ball milkweed). For the shade, we have Mojito alocasia, Autstralian Tree Ferns, Zamias, Dracenas and Caladiums. And much much more, of course. So come on down to market on Saturday and visit us, hear some great music, eat some great food, and enjoy our beautiful waterfront of St. Pete !